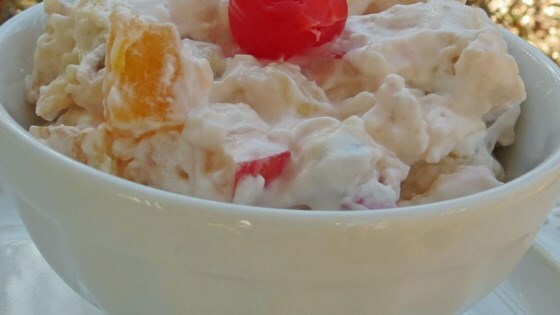 "This creamy, satisfying summer salad or dessert is also a family favorite at Thanksgiving. My mother-in-law could be counted on to bring this dish to all our family functions." Beat the cream cheese and sugar together in a large bowl. On high speed, beat in the whipped topping. Fold in the bananas, pineapple, fruit cocktail, apple, and coconut. If desired, mix in the maraschino cherries, pecans, and raisins. Pour the salad into a serving bowl, and chill 1 hour before serving. Please note that because of the bananas, this isn't a storable recipe. I should have put that in the recipe info, but I'm new to this! Make this dish close to its serving time. This was good but it does need to be eaten the day you make it. I made this for Christmas dinner, and my family loved it.